Ambrosia relays worldwide folk medicines through crafting non-alcoholic botanical elixirs. We offer a comprehensive assortment of libations made from the highest quality, most ethically sourced ingredients. All of our medicinal infusions, extractions, and probiotics are handcrafted to promote optimum wellness and vitality. Our chefs create menus through timeless and culturally diverse recipes. Similar to our Elixirs, our Alchemical Edibles consist of only the freshest, most sustainable ingredients. All masterfully portioned to enliven the senses. 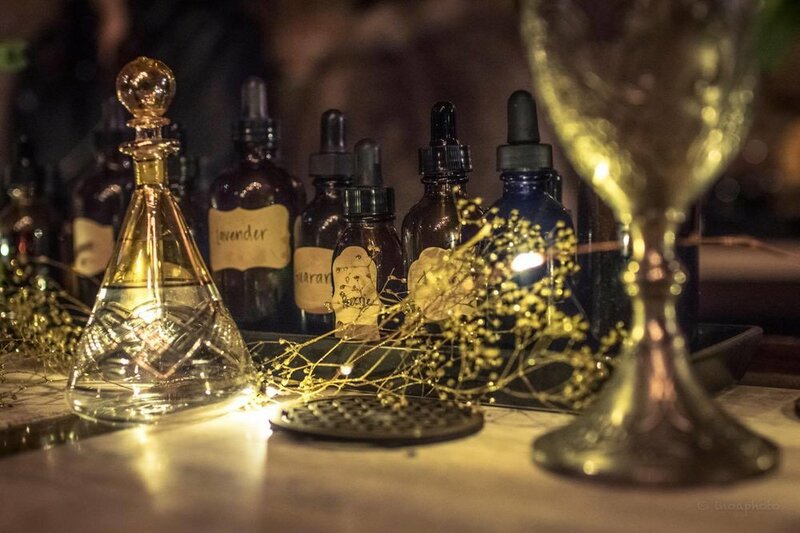 OUR TRAINED HERBALISTS GUIDE EACH PATRON THROUGH OUR SELECTION OF MORE THAN 50 DIFFERENT HERBAL TINCTURES, BITTERS DECOCTIONS. ELIXIR ACCENTS ALSO INCLUDE OUR HERBAL ICE CUBES, MEANT TO FURTHER ENHANCE AND CUSTOMIZE YOUR ELIXIR EXPERIENCE. IN COLLABORATION WITH OUR PARTNERS FUTURE CLEAR, RELIQUARIUM AND JUNXION NYC, AMBROSIA ELIXIRS GATHERS TOGETHER THE VARIOUS THREADS OF PRODUCTION TO CO-CREATE MAGICAL AND INVITING GATHERING SPACES THAT EMBODY ORGANIC ENVIRONMENTS AND A GLOBAL CULTURAL AESTHETIC. WE PROVIDE A FEAST FOR THE SENSES, WHERE GUESTS ARE INVITED TO ENGAGE WITH THE WORLD THROUGH A SPECTRUM OF FLAVORFUL HERBS, SPATIAL DESIGNS, MEDICINES, AND CULTURES.